The iPad offers a fairly distraction-free writing environment, thanks to iOS’s one-app-at-a-time design and emphasis on minimal interface. 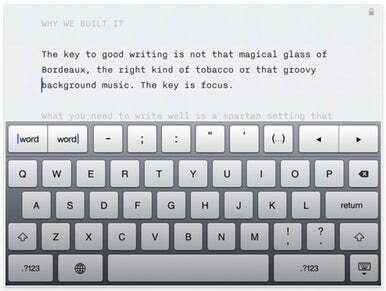 But Information Architects wants to help your inner writer become even more focused with Writer, its new iPad app. At first glance, Writer appears to be an extremely minimal text editor that hails back to the typewriter, with its off-white page color, spartan toolbar, and monospace font. (Fun fact: it’s Nitti Light, created by font shop Bold Monday for use on the iPad). But Writer offers a few unique features: a “Focus Mode” can fade out all text but the latest three lines you’re working on, and “Reading Time” estimates how long your text will take to read aloud. Perhaps most interesting, Writer adds extensions to Apple’s standard iOS keyboard for hard-to-reach characters (quotes, ellipses, for example) and even actions that do not exist, such as arrow keys and word-skipping keys to navigate your text more quickly. Writer can also integrate with Dropbox, allowing you to synchronize your documents as you work on them with your cloud storage and any iOS, Mac, PC, or other device you hook up to your Dropbox account. Writer is available now in the App Store for $5. It requires an iPad running iOS 3.2 or later.